No single industry or sector dominates Houston employment. 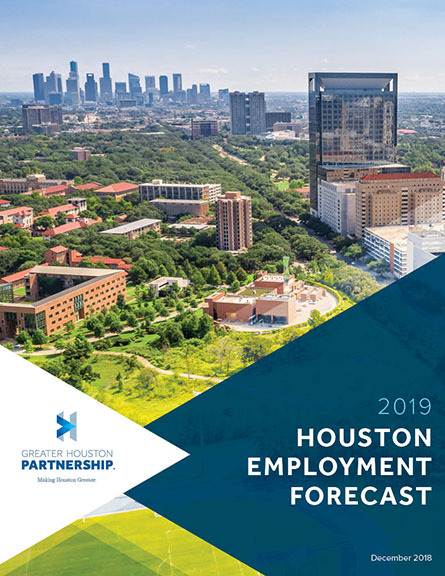 Nonfarm payroll employment in the Houston metro area reached 3,158,800 in October ’18, a new record for the region. Service industries account for 2.6 million Houston-area jobs or four out of five workers in the region. The largest service industries are trade, transportation, and utilities (20.1 percent of jobs), professional and business services (16.4 percent), and education and health services (12.5 percent). The goods-producing sector employs more than half a million Houstonians and accounts for approximately one in five of the region’s jobs. Construction is the largest goods-producing industry with 7.8 percent of total jobs, followed closely by manufacturing (7.4 percent), and upstream energy (2.6 percent). Nearly two-thirds of Houston’s manufacturing jobs involve the production of durable goods, items with a useful life of three years of more. In Houston, this includes items such as oil field equipment, structural steel, and computers.